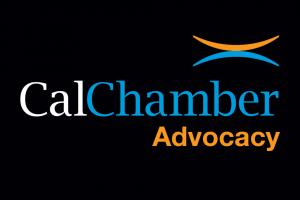 The California Chamber of Commerce released a preliminary list of job killer bills on March 29, 2016 to call attention to the negative impact that 18 proposed measures would have on California’s job climate and economic recovery if they were to become law. 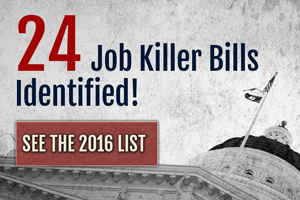 Six more job killer bills were subsequently identified, bringing the total to 24. 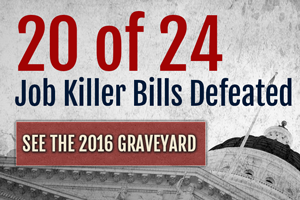 Ultimately, CalChamber opposition prevented 20 job killers from becoming law in their original form. See details below. AB 2667 (Thurmond; D-Richmond) Consumer Arbitration Agreement Discrimination — Unfairly discriminates against arbitration agreements and therefore is likely preempted by the Federal Arbitration Act, which will lead to confusion and litigation, by prohibiting arbitration of Unruh Civil Rights violations made as a condition of a consumer contract for goods or services. Fell short of votes needed to pass Assembly, 5/31/16. Missed deadline to pass house it which it was introduced. AB 2879 (M. Stone; D-Scotts Valley) Employment Arbitration Agreements Discrimination — Unfairly discriminates against arbitration agreements and is likely preempted by the Federal Arbitration Act, which will lead to confusion and litigation, by prohibiting an employer from requiring an individual who is a member of the military to sign a mandatory arbitration agreement as a condition of employment. Never brought up for a vote by entire Assembly and therefore missed deadline to pass house in which it was introduced. AB 2162 (Chu; D-San Jose) Erodes Housing Affordability — Increases the cost of and delays housing and other development projects by eliminating existing mitigation options for impacts to oak woodlands under the California Environmental Quality Act and instead imposes an entirely new and separate permitting process for the removal of even one valley oak tree. Failed Deadline; Assembly Natural Resources Committee 02/29/16. AB 2502 (Mullin; D-South San Francisco/Chiu; D-San Francisco) Erodes Housing Affordability — Increases the cost and reduces the supply of housing by authorizing local governments as condition of development to impose a costly and inflexible price-controlled inclusionary housing requirement and, in doing so, legislatively repeals an established court decision upholding developers’ ability to set initial rental rates for new dwelling units. Job killer tag removed as a result of June 2 amendments, which clarify that the terms of the bill do not apply to for sale housing. 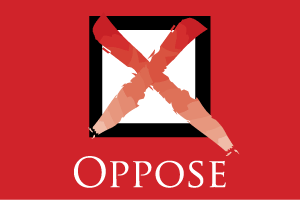 CalChamber remains opposed. SB 1150 (Leno; D-San Francisco) Erodes Housing Availability — Increases liability risk and the cost of residential loans by subjecting the violations of overly complex and burdensome requirements to a private right of action. Signed, Chapter 838, Statutes of 2016. SB 1318 (Wolk; D-Davis) Erodes Housing Affordability — Inappropriately leverages necessary affordable housing in order to solve infrastructure issues with the consequence that the housing won’t be built by imposing requirements on water or waste water districts to serve certain communities first. Failed Deadline. Last location was in Assembly Local Government Committee, 6/9/16. Budget Trailer Bill. Increased Permit Processing Costs — Significantly increases the costs of permitting aerospace, recycling, oil and gas, and other critical waste facilities by eliminating permit applicants’ option to be charged a predictable flat permitting fee and instead giving the Department of Toxic Substances Control carte blanche to charge whatever fee it determines, notwithstanding well-recognized and self-acknowledged deficiencies in DTSC’s current permitting program that have resulted in excessive delays in permit processing. Proposal transferred into AB 1611 and SB 839. AB 1611 (Committee on Budget) Increased Permit Processing Costs — Significantly increases the costs of permitting aerospace, recycling, oil and gas, and other critical waste facilities by eliminating permit applicants’ option to be charged a predictable flat permitting fee and instead giving the Department of Toxic Substances Control carte blanche to charge whatever fee it determines, notwithstanding well-recognized and self-acknowledged deficiencies in DTSC’s current permitting program that have resulted in excessive delays in permit processing. Placed on the Assembly Inactive File, 8/25/16. Proposal finalized in SB 839. SB 839 (Committee on Budget and Fiscal Review) Increased Permit Processing Costs — Significantly increases the costs of permitting aerospace, recycling, oil and gas, and other critical waste facilities by eliminating permit applicants’ option to be charged a predictable flat permitting fee and instead giving the Department of Toxic Substances Control carte blanche to charge whatever fee it determines, notwithstanding well-recognized and self-acknowledged deficiencies in DTSC’s current permitting program that have resulted in excessive delays in permit processing. Signed 9/13/16—Chapter 340, Statutes of 2016. AB 1727 (Gonzalez; D–Sherman Heights) Price-Setting by Independent Contractors — Harms consumers and the California economy by essentially allowing independent contractors in almost every industry to collaborate and set prices for their services as well as other terms and conditions of their contracts, which will raise prices for consumers as well as subject them to costly litigation with the threat of triple damages if consumers terminate those contracts. Failed Deadline; Assembly Judiciary Committee 4/21/16. AB 2895 (R. Hernández; D-West Covina) Private Right of Action Exposure — Inappropriately exposes employers to increased litigation costs by adding a private right of action, the risk of class action lawsuits and Private Attorneys General Act (PAGA) claims related to the employer’s written Injury and Illness Prevention Program (IIPP) by requiring employers to provide their employees or their representative a written copy of the IIPP, a violation of which, in certain circumstances is subject to injunctive relief. Senate Inactive File, 8/22/16. SB 878 (Leyva; D-Chino) Mandated Scheduling Requirement — Eliminates worker flexibility and exposes employers to costly penalties, litigation, and government enforcement, by mandating employers in the retail, grocery, or restaurant industry, including employers who have hybrid operations that include a retail or restaurant section, to provide a 21-day work schedule and then face penalties and litigation if the employer changes the schedule with less than 7 days notice, even when the change is at the request of the employee. Held in Senate Appropriations Committee Suspense file 5/27/16. Failed Deadline. SB 1166 (Jackson; D-Santa Barbara) Imposes New Maternity and Paternity Leave Mandate — Unduly burdens and increases costs of small employers with as few as 10 employees, as well as large employers with 50 or more employees, by requiring 12 weeks of protected employee leave for maternity or paternity leave, and exposes all employers to the threat of costly litigation. Failed passage in Assembly Labor and Employment Committee 6/22/16. But see SB 654 (Jackson; D-Santa Barbara) below. AB 2748 (Gatto; D-Glendale) Increases Environmental Litigation — Eliminates incentives to settle lawsuits and instead exposes businesses to multiple rounds of litigation at great expense to the parties and the courts by creating statutory prohibitions on “release” clauses in settlements pertaining to “environmental disasters.” Job killer tag removed due to June 2 amendments, which made clarifications and narrowed the bill to apply only to the Porter Ranch area gas leak or to contamination surrounding the Exide Technologies facility, but CalChamber remains opposed. Vetoed. SB 899 (Hueso; D-San Diego) Increased Frivolous Litigation — Drives up consumer costs and increases frivolous litigation similar to the disability access lawsuits in California, by prohibiting a retailer or grocery store from discriminating against a person on the basis of gender with the price of “substantially similar” goods and subjecting them to a minimum $4,000 of damages for each violation. Held in Assembly Judiciary Committee, 6/21/16. AB 1759 (Bonta; D-Alameda) Gas Price Increase — Jeopardizes the production of California based fuel by banning the use of hydrogen fluoride and hydrofluoric acid at facilities that use more than 250 gallons and are located within two miles of a residence, notwithstanding the fact that there are significant safety regulations in place at the local, state and federal levels. Assembly Natural Resources Committee, 2/18/16. AB 1882 (Williams; D-Santa Barbara) Gas Price Increase — Jeopardizes the production of California based fuel by substantially complicating the existing permitting process for the Underground Injection Control program by imposing duplicative requirements and requiring the Division of Oil, Gas and Geothermal Resources to cede aspects of its permitting authority to the regional water quality control board. Held in Assembly Appropriations Committee Suspense File 5/27/16. Failed Deadline. AB 2729 (Williams; D-Santa Barbara/ Thurmond; D-Richmond) Gas Price Increase — Before amendments, jeopardized the production of California-based fuel supply and increased costs to the industry by revising the definition of an idle well and requiring permanent closure of 25% of California’s long-term idle wells each year. Job killer tag removed due to June 1 amendments, which establish a reasonable closure rate by requiring operators with 250 to 1.000 wells to close 5% of their long-term idle wells each year until they have no more long-term idle wells. CalChamber has no position. Signed 9/9/16—Chapter 272, Statutes of 2016. ACA 8 (Bloom; D-Santa Monica) Lowers Vote Requirement for Tax Increases — Adds complexity and uncertainty to the current tax structure and pressure to increase taxes on commercial, industrial and residential property owners by giving local governments new authority to enact special taxes for storm and wastewater infrastructure, including parcel taxes, by lowering the vote threshold from two-thirds to fifty-five percent. Assembly Local Government Committee, 6/23/16. AB 2782 (Bloom; D-Santa Monica) Targeted Tax — Threatens jobs in beverage, retail and restaurant industries by arbitrarily and unfairly targeting certain beverages for a new tax in order to fund health programs. Assembly Health Committee, 3/31/16. SB 32 (Pavley; D-Agoura Hills) Slows Economic Growth — Increases costs for California businesses, makes them less competitive and discourages economic growth by adopting further greenhouse gas emission reductions for 2030 without regard to the impact on individuals, jobs and the economy. Signed 9/8/16—Chapter 249, Statutes of 2016. SB 654 (de León; D-Los Angeles) Creates Unworkable Hazardous Waste Permitting Process — Discourages investment in upgrading and improving hazardous waste facilities by shutting down hazardous waste facilities if the Department of Toxic Substances Control (DTSC) fails to take final action on the permit renewal application within a specified timeframe, even if the permit applicant acted diligently and in good faith throughout the permit application process. SB 654 was gutted and amended on August 11. See new description and author below. SB 3 (Leno; D-San Francisco) Automatic Minimum Wage Increase — Unfairly imposes a potential 50% increase in the minimum wage by 2022 (actually an 87% increase over an 8-year period when combined with the last increase just implemented in January 2016), and automatically adjusts minimum wage beyond 2018 according to national inflation, with no “offramps” to suspend the indexing if employers are struggling with other economic factors or costs. Signed 4/4/16—Chapter 4, Statutes of 2016. SB 654 (Jackson; D-Santa Barbara) Imposes New Maternity and Paternity Leave Mandate — Unduly burdens and increases costs of small employers with as few as 20 employees by requiring 6 weeks of protected employee leave for child bonding and exposes them to the threat of costly litigation. SB 654 was gutted and amended on August 11. See above for previous description and author. Vetoed. SCA 5 (Hancock; D-Berkeley) Split Roll — Undermines the protections of Proposition 13 by unfairly targeting commercial property owners and increasing their property taxes by assessing their property based upon current fair market value instead of acquired value. Such costs will ultimately be passed on to consumers and tenants through higher prices and will result in job loss as businesses struggle to absorb such a dramatic tax increase. Senate Governance and Finance Committee, 4/12/16.